written by Talha Asad on March 8, 2019, 8:16 p.m.
written by usman ghani on Feb. 12, 2018, 5:49 p.m. I cant seem to find the Fandago burger in the menu. Is the menu outdated? written by Farhan Sarwar on Nov. 11, 2016, 6:39 p.m.
Howdy is truly amazing! Just a touch expensive but overall good. Cheetay delivery services are superb! written by Farhad Ahmad on June 18, 2016, 8:23 p.m. Ordered for the first time from Cheetay, and Howdy was the first restaurant that I tried. And it was as awesome as usual! Delivery was fast, and considering I live in an area where I can't easily expect howdy to deliver, it was a delightful experience having Cheetay deliver it in a reasonable time. 10/10 would order again! written by Usman Younas on March 5, 2016, 11:14 p.m.
You know what a perfect burger is? One with a fat chicken or beef patty, topped with caramelized onions, a tangy jalapeno sauce, double cheese and barbecue sauce. Pair that with a side of curly fries and drink to have a complete and perfect meal. Or imagine a steak medium well done so it’s soft and chewy with a creamy sauce and a side of sautéed vegetables and mashed tomatoes. All of this you can get in affordable prices and all in one place – Howdy in Lahore. 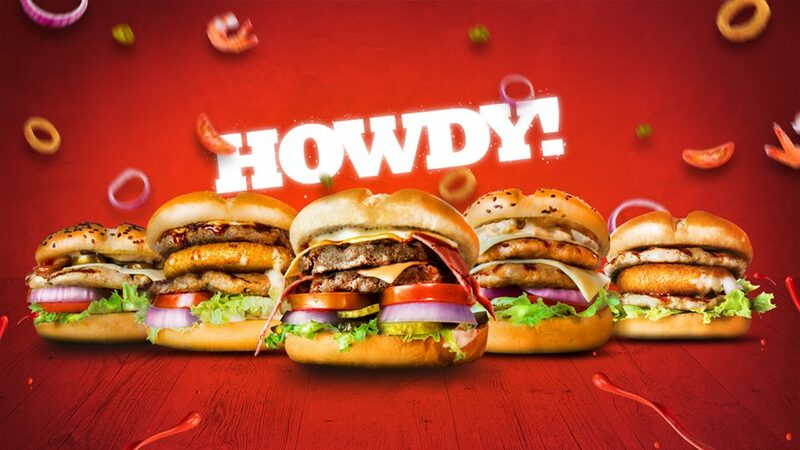 They’ve got the most delicious and mouth-watering burgers like their famous son of a bun double stack beef burger, the rango tango jalapeno chicken burger or their ‘go wild’ chicken burger with a crazy spicy sauce. So don’t look further than Howdy for a burger. And don’t look further than Cheetay for delivery. We’ve got you covered on that end as well. Cheetay riders sprinting at the speed of cheetahs will deliver your order to you while it’s still fresh and hot so that you can enjoy your burger and steak with fries wherever you are. Placing an order through the Cheetay website or the app is very simple. Once a Cheetah is assigned to you, you can even request anything else you would like the rider to pick up on the way while you track your order through the online system. It is really that simple. So don’t lose hope if there’s only daal chaawal for dinner or lunch - trust Cheetay.pk to deliver your Howdy burger to you to liven up your dinner or lunch time.